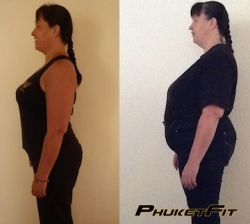 PhuketFit is said to have established themselves as the leader of weight loss in Thailand. Phuket, Thailand, November 06, 2013 --(PR.com)-- People from all around the world flock to Phuket in droves to lose weight and get in shape. Phuket, as a region, has become known "as the go-to-place for health treatments, weight loss and fitness," Kelly from Australia says. "Before PhuketFit, there were small family run places for these types of holidays in Thailand," a local expat, Jerry, explains. "There were some success stories, but it's well established that PhuketFit transformed the industry," he remarks. "PhuketFit is established on delivering safe and reliable training and nutrition in Phuket," comments Rachel, a return guest at PhuketFit. Rachel goes onto say that "their initial aim was to be the gold standard and in my opinion this has most definitely been achieved." "With the rave reviews and success stories, more and more people were encouraged to pack their bags and finally dedicate time to losing weight and getting into shape," Helen from the United Kingdom said. PhuketFit as a company stresses the benefits of caring for ones body and mind. They provide education on certain training and nutrition plans for overall health and weight loss. "They have created programs with inbuilt customisations to better cater for their individual guests," Alex, from Canada, reports. The PhuketFit weight loss program (http://www.phuketfit.com/weight-loss/) is reported by Jerry to have been "an almost immediate success." He goes on to explain how "much of their success is credited to how the program fits the average person and how it truly caters to the clients specific needs." When interviewing Katey, a guest at PhuketFit, she reveals her feelings that "at first I thought you had to be some kind of fitness freak or something to come to one of these kind of places. But when I arrived I realised that actually everyone was in a very similar situation as myself. They, like myself, had let themselves go a bit and needed to lose some weight. I've lost over 6kg over the last 14 days and I have another 6 or 7 to go to get back into my old shape." "The weight loss program is aimed at everyday-people who need to take time out to lose weight and relax. Some guests have a lot of weight to lose, whilst others have just a few kilo's. But everyone comes, loses weight, relaxes and has a great time," a PhuketFit trainer said.